Ask the average listener for the names of the most influential English rock acts of the early sixties and they'll probably rattle off three names: The Shadows (with or without Cliff Richard), The Beatles and The Rolling Stones. I'd like to respectfully submit a fourth. Johnny Kidd & The Pirates. The Argumentative Reader might, of course, be inclined to dispute that last suggestion. That's in his/her nature, and the key element in the counter argument would probably be along the lines of limited commercial success, pointing to a single #1 hit in Shakin' All Over and a relatively slim discography (a mere sixteen singles listed in the Wikipedia entry here) between 1959 and 1965. But let's look at those other candidates for a moment. The Shadows were, admittedly, huge at the time, and prompted any number of would-be Hank Marvins to take up the guitar. You can, for example, cite the early Neil Young in The Squires and early recordings like Aurora and The Sultan. But once you get past the actual era you tend not to hear too much that's obviously Shads-influenced. Or I don't, anyway. In a commercial sense The Beatles turned the conventional wisdom of the early sixties on its ear, set the stage for much of what followed and lead the way through the sixties as far as combining an evolving experimentation in writing and recording with commercial success. We will never see their like again because we'll never see those times (and their antecedents) again. But, over time, that leading the way fades into widespread, albeit very significant, background influence. And The Rolling Stones were, at least at the start of things, The Anti-Beatles. I'd concede their ongoing legacies as the outrageous showmanship we've come to associate with rock stars (not that they were the first in that department) and a significant influence to the continuing genre I've tagged teenage noise, that glorious racket you loved as a kid because it got right up the nose of (and was incomprehensible to) everyone older than your age group peers. So, why Johnny Kidd & The Pirates? Simple. For a start, singer out the front, guitar bass drums behind. Not two guitarists, none of this lead and rhythm bit. One guitarist. Follow that template and you've got, among a multitude of others, The Who and the early Jeff Beck Group with Rod Stewart out front (who were, of course, the prototype for Led Zeppelin). You can add any number of similar outfits after that, but the most significant in this regard are, of course, Dr. Feelgood. According to legend The Who were a two guitar outfit up until the time they opened for Kidd & The Pirates (Townshend: They were a truly tight band, achieving a powerhouse sound with just lead and bass guitars and drums. We decided to go the same way, Roger allowing me to take over on lead guitar so he could concentrate entirely on singing. That's lifted straight from his autobiography, where he goes on to describe Pirates' guitarist Mickey Green's influence on Townshend's emerging technique). Remove the singer and give one of the remaining trio the vocal duties and you've got the classic power trio. Start with Cream and the Jimi Hendrix Experience and you can note any number of examples along the way, including The Jam, right up to Silverchair and beyond. Start listing those who started out in one of those vocal/guitar/bass/drums quartets or a power trio and moved on elsewhere and you've got a whole extra stream of influenced artists. And, of course, you've got what we're looking at here with the singer from one of the most obvious successors to Johnny Kidd & The Pirates in front of a power trio lead by one of their most significant torch bearers. Given the backstory, of course, I was always going to buy this. The January 2013 announcement that Wilko Johnson had been diagnosed with inoperable pancreatic cancer was one of the things that set me off to re-investigate the Dr. Feelgood back catalogue last year. That exercise rekindled a long-standing affection for the Canvey Island quartet that had me picking up a copy of Oil City Confidential, Julien Temple's 2009 Dr. Feelgood doco, and learning of this collaboration in the process. Going Back Home dates back to a chance encounter at the 2010 awards ceremony where Johnson and Daltrey found themselves seated next to each other and bonding over a mutual admiration for Johnny Kidd & the Pirates. A collaboration was apparently mooted at the time, but seems to have been one of those things that would be tackled at some point in the future. The cancer diagnosis delivered a sense of urgency. With Johnson well enough to press ahead with the project when The Who finished a world tour the album was recorded in a week in November 2013 at Yellow Fish studio at Uckfield in East Sussex, near Daltrey's home. 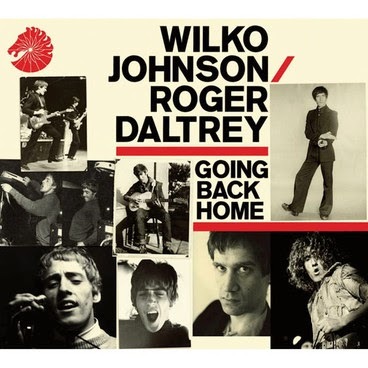 The selection of material was a pretty straightforward exercise, with Daltrey happy to have a go at singing whatever Johnson threw at him, and Wilko obliging with a selection of ten Johnson originals covering the Feelgood era and his subsequent solo career as well as a cover of Bob Dylan's Can You Please Crawl Out Your Window? From the start of Going Back Home, the song Johnson co-wrote with Pirates' guitarist Mick Green for the Feelgoods' Malpractice it's familiar ground with Johnson's trademark choppy riffs intersecting with the Daltrey growl in a meat and potatoes exercise in prime British R&B. Ice on the Motorway and I Keep It to Myself follow before a glorious reading of Can You Please Crawl Out Your Window? Subtle it ain't but, boy does it rock! Turned 21 drops things back a notch, but things gradually kick back up through Keep On Loving You, Some Kind of Hero, Sneaking Suspicion, Keep It Out of Sight and Everybody's Carrying a Gun before things wind up in an entirely appropriate manner with Johnson's ode to the Canvey Island oil refinery (All Through the City). With eleven tracks on an album that nudges the scales at just under thirty-four and a half minutes there might be some inclined to quibble about length, but for mine it's just about right. You really don't want this stuff delivered in massive doses, keep it short and sharp, a series of short arm jabs rather than a lengthy pummelling. You might, if you're inclined to be picky, take issue with the recording too. It's a crystal-clear rendering of Johnson's stabbed chords. Muddy might have been better, but this is a high-definition portrait, entirely appropriate when you're talking what amounts to an epitaph. It's also entirely appropriate that the album appears on Chess, the former home of Muddy Waters and Howlin' Wolf. One suspects the only thing that could have enhanced a magnificently worthy collaboration would have been to record it in Chicago. On the other hand, while 2120 South Michigan is still there and, apparently, still operational, you can't beat the convenience of operating close to home in an environment where you're not working with the ghosts of blues men past looking over your shoulder. In the end, given the circumstances, it's all about convenience, and the only thing that matters, in the end, is what is delivered. On that basis Going Back Home is a fitting way to wind up a remarkable career, a project that underlines the remarkable and often forgotten legacy of Johnny Kidd & The Pirates who were, after all, the inspiration behind The Who, Dr. Feelgood and so many others.